Puerto Vallarta has established itself as a destination that captivates those with an artistic bent, the city’s natural assets and unique places inspiring sculpture, visual arts, music, performing arts, cinematography and photography, with literature no exception, either by appreciating it while reading a best seller or putting ideas down on paper. If you want to spark your imagination in a comfortable space with delicious food on your table, surrounded by the region’s abundant flora and fauna, we suggest visiting one of the following bistros to be inspired and get in the specific mood you need to create your next work of art. Located at the entrance to Marina Vallarta, right across from the whale sculpture “La Ballena y su Cría,” Amadeo’s Bistro is divided in two. 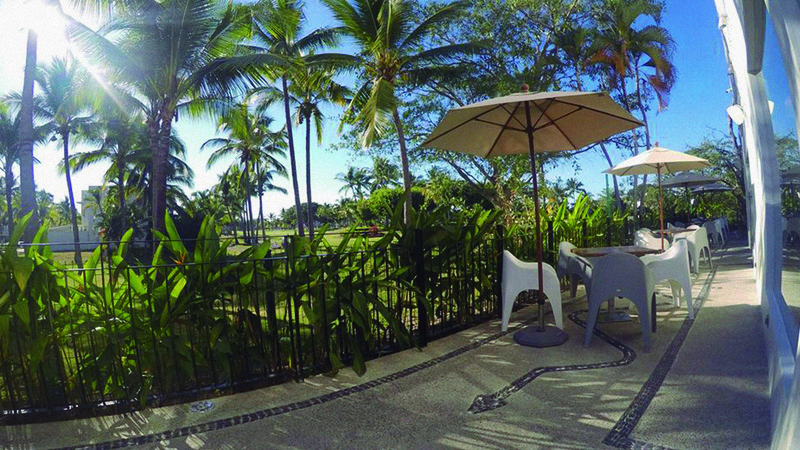 The front has a climate-controlled area that will whet your appetite with its open kitchen, and to the back you will be surprised by its spectacular outdoor terrace offering unbeatable views of one of Marina Vallarta Golf Club’s largest lagoons. A large tree by the lagoon serves as home and refuge for numerous animals, from iguanas, garrobos and herons to crocodiles and turtles (of all sizes) resting around its trunk. If you are lucky, you also will see other birds, fish, reptiles and amphibians, all coexisting in harmony. The menu, ideal for breakfast, features fruit dishes (such as Mosty 1, which includes apples, blueberries, strawberries and blackberries), waffles (such as the Traditional, served with turkey ham or bacon), as well as house specialties such as French toast, croissants and chocolatines, among others. Its extensive menu also includes salads, omelets, baguettes, wraps and typical Mexican specialties. A visit to Amadeo’s Bistro is a nod to the inspiration you will surely receive in the midst of an environment that satisfies both appetite and imagination. The emblematic Cuale River Island is the privileged home of Le Bistro Jazz Café. A cozy restaurant on the river’s bank, like a garden hidden in plain view, it offers a quiet setting away from the city’s hustle and bustle. Here, the relaxing sound of the river blends harmoniously with pleasant live music. The sophisticated ambiance is full of bright colors, highlighted by modern decor on the walls. In addition to providing shade for most of the day, the branches of the large trees bordering the river serve as home and refuge for birds, mammals and reptiles. If you want to catch a glimpse of animals such as iguanas, lizards, raccoons, possums, parrots and herons, you will need to pay close attention to the surroundings. Try some of their specialties that fuse Mexican and international cuisine, with starters such as fried calamari (with garlic mayonnaise and chipotle cream) and mussels Provençal (with Pomodoro sauce) the prelude to delicacies such as grilled rib eye (with smoked mushroom sauce, baked potato with bacon, cream soup and salad of watercress and fresh lettuce) or delicious BBQ pork ribs. With such a sophisticated setting and natural attractions in view, visiting Le Bistro Jazz Café is ideal for letting your imagination run wild. 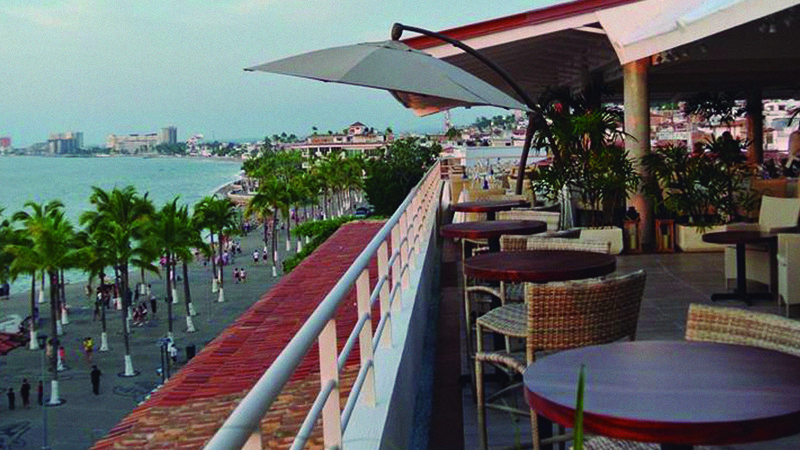 Above the main plaza in the center of Puerto Vallarta, Bistro Teresa is a pleasant restaurant located on the fourth floor of Vallarta Plaza, its tables on the terrace deserving special mention. From there you can view part of spectacular Banderas Bay, as well as various city icons, including the Church of Our Lady of Guadalupe, the old city hall and the Malecón. Unlike the bistros mentioned previously, where the exuberant flora is an inherent element of the decor, this restaurant inspires through the contemplation of an ever-changing panorama, the view toward the bay during one of Puerto Vallarta’s world-famous sunsets a moment worth preserving forever. Its menu of contemporary specialties with Mexican accents may include pear and fig salad, fish tamale, octopus tostada, red snapper sope, lamb ravioli with hibiscus sauce, giant shrimp over ravioli with blue cheese sauce, Mexican risotto with grilled chicken, salmon with citrus sauce and pork loin with tamarind mole, among many other options, complemented by exquisite desserts. A visit to Bistro Teresa means the opportunity to appreciate part of the destination from a different perspective, which will immediately awaken inspiration. 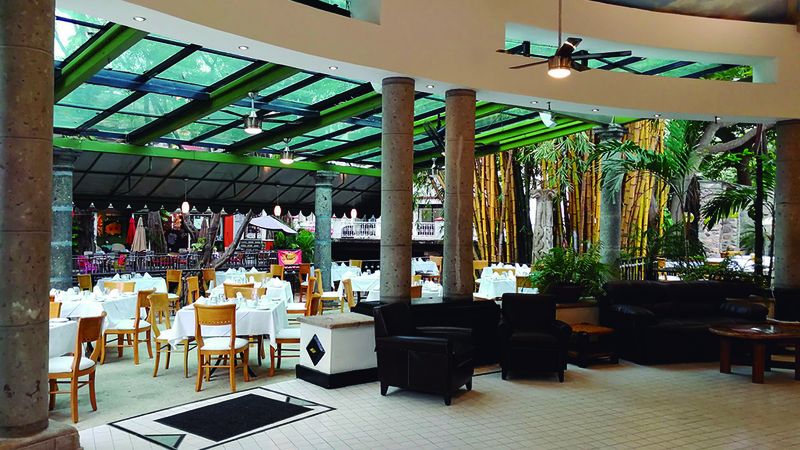 Although each artist is different and not everyone is inspired in the same way, in Puerto Vallarta and Riviera Nayarit you are sure to find the ideal place for your muses to emerge while you please your palate. It’s just a matter of venturing out and giving free rein to your imagination.